There’s nothing worse than waiting too long for something and then missing out completely. This is what happen to us recently at Lamill Coffee in Baltimore’s Harbor East. For a brief moment they offered cupcakes, but we kept pushing off our visit and sadly they don’t make them anymore. When they first opened, they were also known for their beignets, which they also stopped selling. Ugh. Utter disappointment. Lamill hit the Baltimore coffee scene with a bang, bringing their own roasted beans and a variety of brewing techniques, including hand drip and siphon—which is seriously cool to watch. The atmosphere is a mix of sleek and rustic, which they’ve blended really well. The blog, Dear Coffee I Love You, has written about their coffee process and has amazing photos of the interior. You can check that out here. When we asked the nice employee why they stopped making cupcakes, she explained that they were really just okay, and Lamill didn’t want a sub-par confection on their menu. I totally understand that and, lucky for us coffee-loving sweet eaters, we like just about anything made with sugar. While they don’t have beignets or cupcakes anymore (sigh…), they do still have a large assortment of pastries and cookies, including parisian macarons. We each selected a different macaron, and we each thought ours was the best. Elisa had the mint chocolate, Jenn got the cookies and cream, and I chose the blueberry. 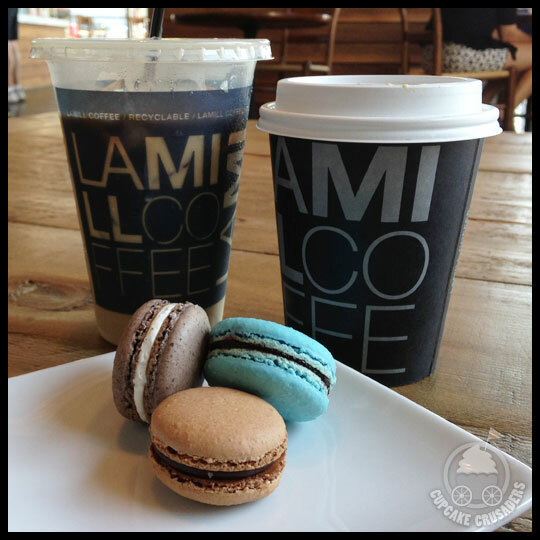 Lamill makes a great macaron with a perfectly crunchy outer shell and soft, moist, center. Each paired perfectly with our coffee selections. Though they don’t sell cupcakes or beignets anymore, they are making their own doughnuts with a variety of flavors. On our visit, they didn’t have them out at first, but just before we left had the opportunity to try one. The cake was a lot more dense than we anticipated, and a bit on the chewy side. 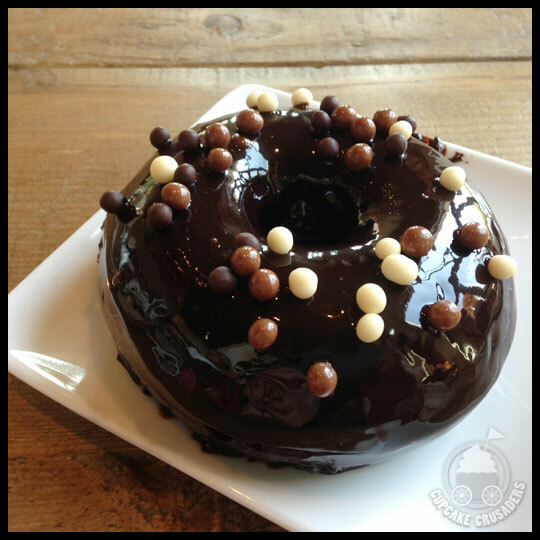 I wouldn’t say it was a bad doughnut, just not at all what we expected. I would definitely like to try more. Lamill is a great addition to the Baltimore Coffee scene. They have even started a campaign to encourage people to explore Baltimore’s local coffee shops, instead of sticking with the big names. To participate, just visit their shop and pick up their “Disloyalty Card.” You can also visit the participating coffee shops: Charmingtons, Pitango Gelato, Sidewalk Espresso, High Grounds, and Dooby’s. Once you’ve purchased a drink from each location and had your card stamped, you can receive a complimentary beverage from the shop of your choice. We think this is so awesome and a great excuse to explore the city. Crumbs Bake Shop Has Come to Maryland! 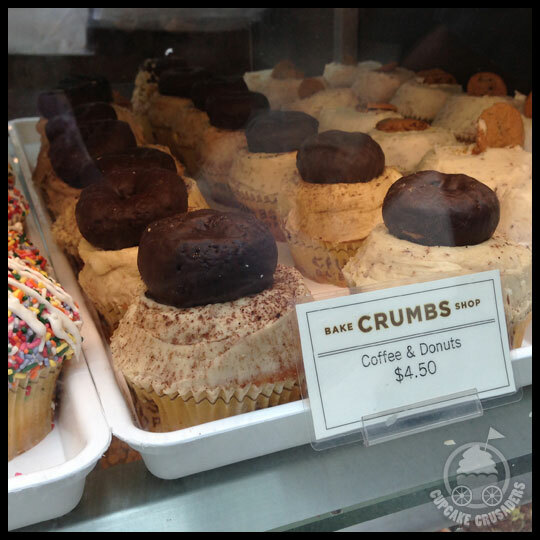 It’s no secret that us Crusaders love Crumbs Bake Shop. After discovering one of their shops on a girls’ weekend in New York City, it has become somewhat of “must-have” on all our trips to the Big Apple. 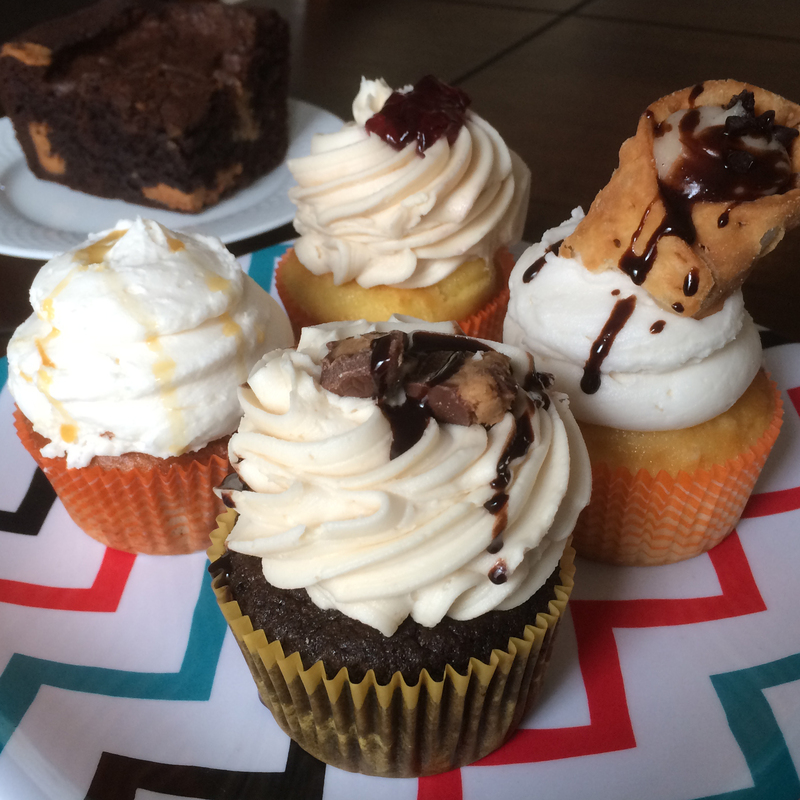 However, we’ve read mixed reviews on their franchises outside of New York, even though Crusader Elisa has enjoyed their cupcakes in the DC area. When we heard that a few local malls in Maryland would become home to their own Crumbs locations, we knew it wouldn’t take too long before our first visit. 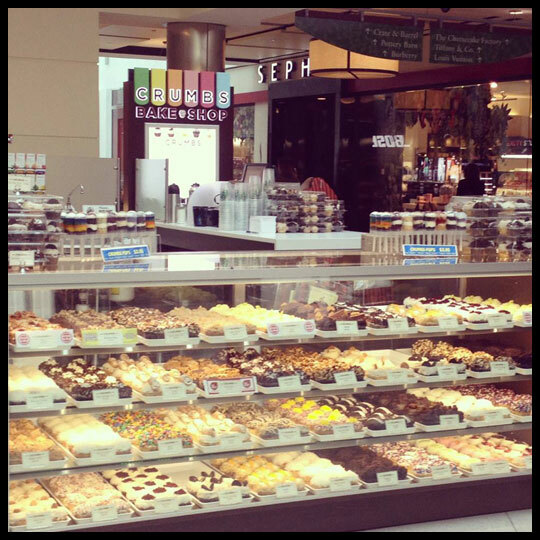 When I stopped by the new kiosk located in Towson Town Center, I noticed that, in addition to a variety of cupcake sizes and flavors, they offered Starbucks Coffee, cupcake push-pops, and the candy bars that Elisa recently reviewed. When faced with a display filled with tempting flavors, it’s always hard to pick just one, but when I saw the Coffee & Doughnuts cupcake, I was sold. How could you not be? There’s a whole mini doughnut sitting on top of a pile of coffee frosting. It was an easy choice for this coffee lover. I have to admit, I had very big expectations for this cupcake. I wanted so badly for it to be good, and it was! The frosting had a nice sweet coffee flavor, almost like coffee ice cream. The cake was Crumbs Bake Shop’s standard buttery, moist yellow cake, which I have come to expect from them. It had a subtle enough flavor that the coffee flavor from the frosting came through really well. Unfortunately though, the doughnut on top was dry and reminiscent of a convenience store packaged doughnut (which came as no surprise, since that is exactly what it looked like). Despite the doughnut on top, I would definitely get this cupcake again. With the location being a kiosk at the mall (and no kitchen in sight), I was pretty impressed by the quality. This makes me very curious about how Crumbs is running their operation with so many franchises (where do they bake, how do the ship?) 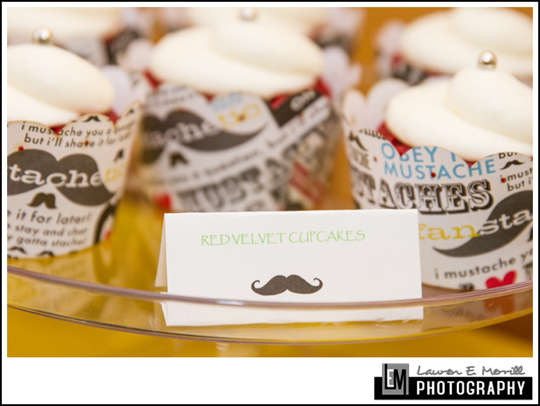 because if the doughnut on top had been better, I would have given this cupcake an A+. 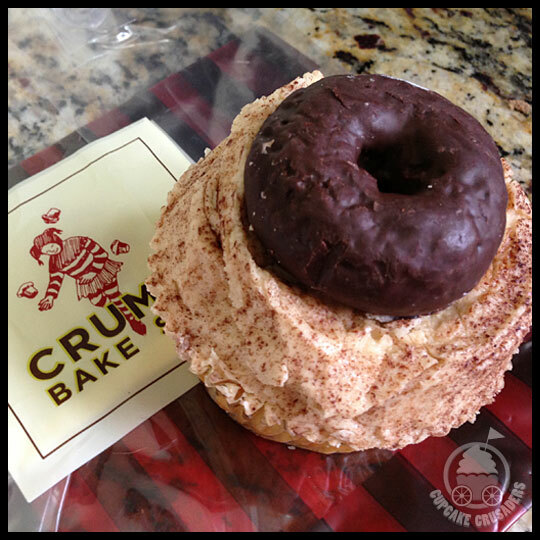 If you are a Maryland local and would like to try Crumbs Bake Shop, you can check out their new locations at the Columbia Mall and White Marsh Mall, in addition to Towson Town Center. If you don’t live in Maryland, DC, or New York, visit their website to see if they have a location near you! Anyone who knows me understands that the real reason I love to go to baseball games is for the food and drink. Beer, soda, peanuts, nachos, pulled chicken sandwiches, fries… the list goes on. Of course I like watching the game too, but let’s be honest, the game is so much better when snacks are involved. On my most recent trip to Camden Yards, my husband, Ken, and I met up with my sister-in-law and her new boyfriend. Ken and I were running late and so we missed the O’s practice time and the first pitch, which was given that night by Ravens player Lardarius Webb. I think my husband was a little bummed because he is a huge Ravens fan and he also missed out on seeing his sister catch a baseball during the pre-game warmups. But with a beer in hand, we—well, at least I—happily made our way to our seats. A DESSERT CART WITH CUPCAKES! 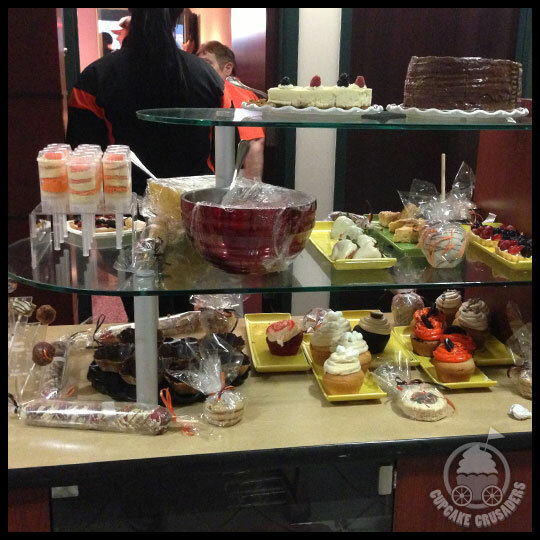 Not only was it a dessert cart filled with cupcakes, cake pops, and push pops, but they were being served right outside of Lardarius Webb’s private suite, which was swarming with Ravens players. Because of the high-profile suite, we had to wait—for what seemed like forever—to finally buy a cupcake at a steep price of $6, which is probably the most I’ve ever spent on a normal sized cupcake. Unfortunately the high price didn’t buy high quality. 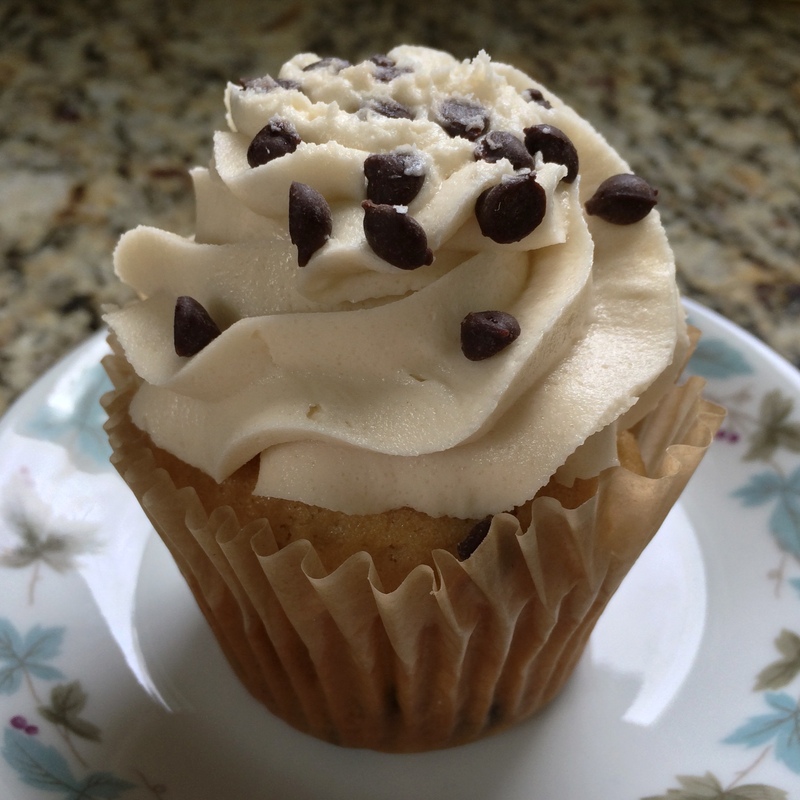 The frosting on this Cookies and Cream cupcake lacked any flavor other than food-coloring. The cake was more like pound cake than what you would normally find on a cupcake, but actually had a decent flavor. Since I wasn’t impressed with the frosting, I ignored it and focused on the cake. After a few bites I ran into a whipped filling that was a little too sweet for my taste buds, so left that lying next to the frosting while I finished the cake. Event though this cupcake didn’t come close to meeting my expectations, the nachos, peanuts, and beer certainly made up for it. 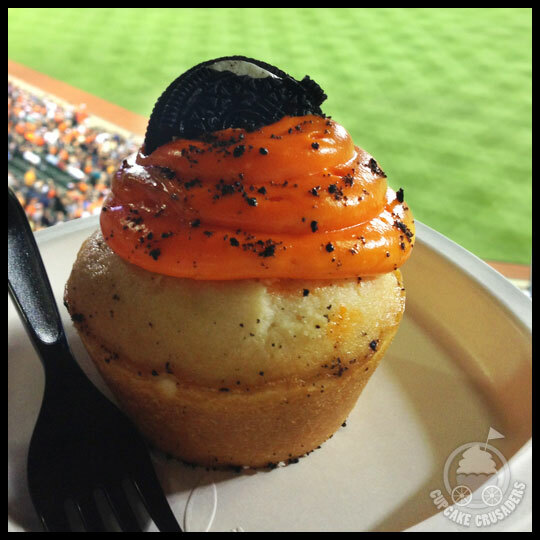 Camden Yards should probably just stick to what they do best: typical ballpark food. One bad cupcake couldn’t put a damper on my night though because my sister-in-law had her baseball signed by Lardarius Webb and the Orioles won! Go O’s!